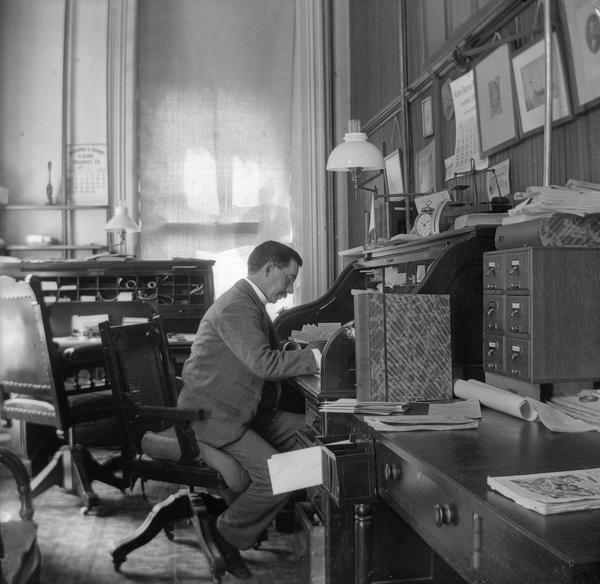 Reuben Gold Thwaites, secretary of the State Historical Society, at his desk in the South Wing of the third Wisconsin State Capitol. Thwaites succeeded Lyman Draper as head of the Society in 1887, and it was Thwaites who was responsible for many of the progressive practices that made the Historical Society a national leader in its field. This portrait embodies Thwaites' reputation as a dynamic administrator and a tireless historian. It also permits us an excellent view of the Eastlake swivel chairs in his office.